Apple released new update iOS 11 that bring us a many new features like Screen Recording, Type to Siri, Siri translation, newly Control Center, etc. At the same time, new update always bring some new problems or bugs. In this blog, we will talk about Apple Safari problems after updating to iOS 11 or even the newest iOS 11.1/11.2, and provide some basic troubleshooting tips to fix Safari not working on iPhone iPad. If you’re still running in iOS 10, you can also follow tips below to fix Safari not working issue. 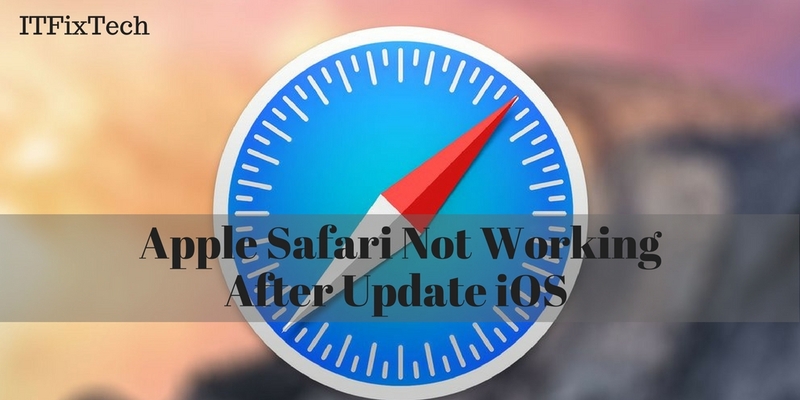 After updating iOS, iOS testers and developers reported some Apple Safari issues, such as Safari content blocker doesn't work, Safari crashes often and Website interface is broken in Safari. If you are one of old iOS device users who have been using iPhone iPad for years, you may know that Safari problem is one of common iOS problems and there are some basic tips every iOS user should have to follow when meeting these type of problems. Then, what are these tips? Now, let's have a look. you can try to change a different Network and try again. Make sure that your device is well connected to the Internet, no matter Wi-Fi or Cellular Network. If you are using Wi-Fi, check if your router is connected to Internet and DNS settings are correct. To fix your Safari issue by resetting all Network settings to default. To reset network settings, just go to Settings > General > Reset > Reset Network Settings. Notice that this method will remove all Wi-Fi login info. Therefore, after you reset Network settings, you have to re-enter password to connect Wi-Fi. cleaning out cache, cookies and history may be helpful. To remove all history and website data, just go to Settings > Safari > Clear History and Website Data. But notice that you will lose all browsing history, login data, theme selection, preferences and other customized. A fully power off on your iPhone, iPad or iPod touch to fix your iOS 11.2/11.1/11/10 Safari problem. In this way, all processes on your device will be closed and the iOS memory will be completely released, which is helpful to let your Safari work in normal in iOS 11.2/11.1/11/10. Note: Finally, we would like to share the details of the Apple Support page, for further live assistance. In case none of the above help you out then you need not worry you can simply visit the Apple Support. You can even contact the Safari Technical Support at 1-855-925-7088 to talk to expertise about any of your Safari issues. If you like our Blog, don’t forget to hit one of the share buttons to help your friends. Do let us know in the comments below or on Facebook, Twitter, and Google Plus.